This article intends to provide detailed, step-by-step instructions that’ll help you understand, how to set up ELEX Stamps.com Shipping Plugin with USPS Postage for WooCommerce. Refer the product page to know more about other various features of the plugin. Stamps.com is a leading provider of Internet-based postage services. It provides service to small businesses, enterprises and online retailers to print official United States Postal Service (USPS) stamps and shipping labels. Stamps.com sends customers a digital scale to weigh letters and packages to ensure the correct amount of postage is applied to the piece of mail. The amount of postage applied is then deducted from the customers’ Stamps.com account. Customers can print postage on envelopes, regular paper or adhesive labels. Our Stamps.com Shipping Plugin with USPS Postage for WooCommerce provides easy, seamless integration of WooCommerce with Stamps.com services. In addition to accessing real-time shipping rates, the plugin also provides print label and shipment tracking facilities. How to print shipping labels in WooCommerce Stamps.com shipping plugin? How to download WooCommerce Stamps.com shipping labels? How to create WooCommerce Stamps.com shipment labels in bulk? How to track shipments with WooCommerce Stamps.com shipping plugin? How to add funds to my Stamps.com Account? How to generate Stamps.com USPS shipping labels in bulk? How to auto-generate and email Stamps.com USPS shipping labels? Real-time shipping rates: Based on the shipping destination address, product weights and dimensions, the plugin fetches real-time rates from USPS. Print shipment label: You can print shipping labels from order pages in the back-end of your WooCommerce store. Postage is automatically paid on the printed labels using your Stamps account. Shipment Tracking: The tracking number returned from Stamps.com while generating the label will be added to order notes and sent as part of the order completion email. Shipments can be tracked by customers as well as shop owners. Box Packing: You can select the desired box packing method. This will also affect the shipping rates displayed on your cart/checkout page. Compatibility: The plugin is now compatible with TM Product Extra Options and TM Product Extra Options Weight AddOn. All these features (and many more!) are bundled into one solution to serve your WooCommerce-Stamps.com shipping integration needs for your online store. Dashboard > Plugins > Installed Plugins > Stamps.com WooCommerce Extension (USPS) > Settings. Now that we have explored the features of the plugin, and have installed it, let’s get down to configure the plugin. The general settings are as shown below. Real-time Rates: Tick this checkbox to access real-time rates from USPS. The API Setting fields are as follows. User ID and Password: For accessing Stamps.com APIs, you need to register with Stamps.com. After registration, you will receive User ID and Password. Enter the received credentials in the respective text fields. Debug Mode: If you are not getting proper rates ( lesser or higher than expected), not getting all the available shipping options, or not getting any rates at all, then you can tick the Enable Developer Mode checkbox to find the error(s). You can also see the warning(s) by our WooCommerce Stamps.com Shipping plugin. By enabling debug mode, you can trace issue using log. You can see information about debugging at the top of cart and checkout page. After enabling debug mode, add a product to cart. Go to cart or checkout page to see the debugging information. For detailed information on debugging, see how to troubleshoot Stamps.com Shipping Plugin for WooCommerce?. API Mode: You can switch between Test and Live mode for making a purchase and printing labels. The test mode does not involve any real money transaction and can be used test features and settings, before going live. You should contact Stamps.com to obtain test credentials and test API URL. In addition to this, you should request them to whitelist your website host IP and your personal computer IP so that you can access/view the label URLs (generated in test mode). Insurance: Tick this checkbox to enable the insurance option, that will send the total amount to stamps for insurance. Insurance provides coverage in the event that the packages are lost or damaged while in transit. If a shipper requires protection for items, then insurance may be arranged at an additional cost by USPS. For more information on insurance, see USPS Insurance – Stamps. This section contains settings that will determine the services that will be made available to the customers in your store. The settings are as shown below. Method Title: Allows you to set a custom title for Stamps.com shipping method. This title will be visible on cart and checkout page under Shipping options. Method Available to: This field allows you to select countries, for which Stamps.com shipping method will be available. All Countries: Choose this option if you offer Stamps.com shipping method to all over the world. This option is selected, by default. Specific Countries: Provides option to select desired countries. The Stamps.com shipping method will be available only in selected countries. Origin PostCode: Enter the postcode of the sender. This postcode will be used for calculating shipping rates. The following settings determine the rates you offer your customers. Fallback: If Stamps.com fails to return any rates, the fallback will be applied. This allows your customers to check out the process even when stamps.com does not return any rates. Priorities Flat Rate: Tick this checkbox if you wish to give higher priority to flat rates when package rates and flat rates are available together. Restrict Media Mail: Select the Shipping class(es) for which you want to apply the Media Mail Rate. Read more about Media Mail, here. First Class Package Service™ International. Our WooCommerce Stamps.com shipping plugin also enables you to select package type(s) for the required service. The available package types are listed in the table below. Postcard It is a single sheet of paper, but to qualify for mailing it must be: Rectangular, At least 3-1/2 inches high x 5 inches long x 0.007 inches thick, No more than 4-1/4 inches high x 6 inches long x 0.016 inches thick. Letter A mail piece with its own special envelope or a piece that will be folded to letter-size. To qualify for mailing letter, it must be: Rectangular, At least 3-1/2 inches high x 5 inches long x 0.007 inches thick, No more than 6-1/8 inches high x 11-1/2 inches long x 1/4 inch thick. 15” long, 6 1/8” and 12” high, or ¼” and ¾ thick. Thick Envelope Thick envelope. Envelopes or flats greater than ¾” at the thickest point. that clearly indicates “Small Flat Rate Box”. indicates “Large Flat Rate Box”. Flat Rate Padded Envelope USPS flat rate padded envelope. Large Package Large package. The Longest side plus the distance around the thickest part is over 84” and less than or equal to 108”. part is over 108” and less than or equal to 130”. 10” x 7” x 4 3/4” USPS box that clearly indicates “Regional Rate Box A”. You can enable desired services with package types in the Services table. The unchecked services will not be displayed on the website even though they are available services from USPS. Please go to USPS Mail & Shipping services for detailed information on each service. The first column represents all service names. You can set a custom service name in the given text field. In the second column, you can select the packages that you want to offer. By default, Package (as package type) is enabled for all the service. The last two columns are used for price adjustments. You can add or subtract the required amount to/fro actual shipping cost. Use minus sign (-) for subtracting the amount. You can specify the price in percentage or amount value. For example, consider shipping cost of First-Class Mail (Package) returned by Stamps.com is $5. Total cost displayed for Regular Post is $10 ($5+$5). Total cost displayed for First-Class Mail is $5.5 (the 10% of 5 is added to 5). Total cost displayed for First-Class Mail is $10.5 (the 10% of 5 is added to 5 + 5 to get the actual). Click on Save changes button to save the settings. Following settings are required for generating shipping labels. Time Zone Offset (Minutes): If you wish to change the shipment creation time on the printing label, you can specify the time value in minutes that will be added to the current time. To reduce the time from the existing time, use the minus (-) sign before the time value. Stamps.com Account Manager: Tick this checkbox to enable account manager meta box in WooCommerce admin order pages. With this setting, you can add funds to your Stamps.com account to purchase more postages. PNG: This option prints the label in Portable Network Graphics which is a raster graphics file format that supports lossless data compression. JPG: This option prints the label in Joint Photographic Experts Group which is most commonly used for storing and transmitting photographic images on the World Wide Web. PDF: This option prints the label in Portable Document Format which is used to present document independent of the application, software, hardware, and operating system. Default: Uses default page size. Label 85X11: Uses letter size paper (8.5 x 11 inches) to print labels. Label Size: Uses label size paper (4 x 6 inches) to print labels. Note: The above sizes apply only when image type is PDF. Print Layout: This setting determines the format of the label image. The availability of the given options will vary based on shipping service and label format. Default: Uses the default print layout. Healthy: Label of 4×6 inches gets generated. For the Critical Mails, this option generates labels for windowed envelopes. NormalLeft: Label of 4×6 inches gets generated on the left side of the paper. NormalRight: Label of 4×6 inches gets generated on the right side of the paper. Normal4X6: Label of 4×6 inches gets generated. This option only applies to Critical Mails and Library Mails. Normal6X4: Label of 6×4 inches gets generated. This option only applies to Critical Mails. Normal75X2: Label of 7.5×2 inches gets generated. This option only applies to domestic First Class or Priority packages. NormalReceipt: Label of 6×4 inches and receipt gets generated. NormalCN22: A 4×6 label on an 8.5×11 sheet with Customs Form CN 22 gets generated. Hidden Postage: Tick the checkbox to hide the actual postage amount on Print label. This feature is useful for users who wish to hide the actual postage amount from the recipients of packages. Bulk Shipment: For bulk shipment, you can select default domestic and international service. Select desired options for both services from the given list. This default service will be chosen, when no USPS service is selected during checkout. Sender Details: Enter the sender name, company name, address and contact information in the respective text fields. ITN: Enter ITN for international shipping. ITN means Internal Transaction number, used for some international packages that use the multi-page form and may require Electronic Export Information (EEI) to be filed through the Automated Export System (AES). For more information about ITN, see what is an Internal Transaction Number (ITN)? You can get real-time rates for items using API. With price calculator, you get real-time postage rates for domestic, as well as international shipping. Real-time rates are calculated based on product dimensions and weight, and the best-fitted box rates are returned from USPS. This rates will depend on the method used for packing the parcel. Our ELEX WooCommerce Stamps.com USPS plugin offers three types of parcel packing methods. They are as shown below. In this option, each item in the cart is packed separately. Total shipping cost is calculated by adding the shipping cost for each item. This option is selected by default. 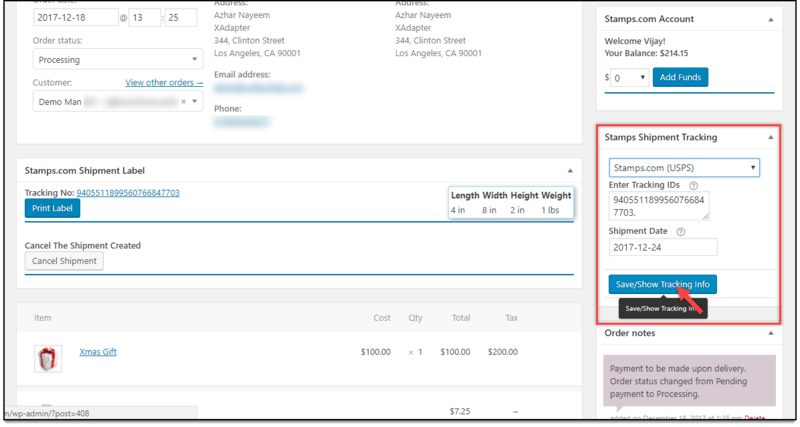 If packing items individually does not suit your business, then you can define custom box sizes under Box Dimensions section. All the cart items are packed into custom boxes defined in Box Dimensions settings. The best fit box is automatically chosen from the defined boxes. This is the recommended option. You can read through setting up box dimensions to understand box packing in detail. The settings are as shown in the screenshot below. Volume Based Packing – With this algorithm, the items are placed in the box based on the total volume of both items and the box they are packed into. Stack First Packing – Using this algorithm, items are stacked or pilled unto one another, based on either length, width or height of items as well as the box they are packed into. To know more about this algorithm, read what is stack first algorithm? Box Dimensions: This setting is applicable only when Pack into boxes with weight and dimension is selected. Here, you can define the outer and inner dimensions of boxes. Outer dimensions are the dimensions of the package. Inner dimensions are the dimensions of the product. For heavy packing box, enter the weight of the box so that it is added to product weight, to calculate shipping rates. You can tick the respective Letter checkbox if you want to mail letters. Based on your requirement, you can add or remove box dimensions. Tick the Enable check box of the respective boxes to enable or activate them. If these checkboxes are unchecked, you will not be able to use the selected box(es). Enter maximum weight limit for packages. In this option, the weight of all the cart item is summed up and items are packed with maximum weight limit in the box(es) and passed to API to get rates. In addition to this, you can specify the process of packing, that is, you can pack heavier items first, pack lighter items first or pack items purely divided by weight. Below is a screenshot showing the order total weight settings. Box measurement unit: Tick this checkbox to consider the unit of weight and dimension selected in WooCommerce settings. If this setting is unchecked, pounds and inches (lbs/inc) for weight and dimension will be taken by default. Finally, click Save changes to save the plugin settings. Different products might need a different level of processing. Hence, our plugin provides three important product level settings for stamps.com shipping as shown below. HS Tariff Number (Stamps): HS is a standardized system of names and numbers to classify products. Shop owners can provide HS number of the product so that international shipments are processed smoothly. Country of manufacture (Stamps): Enter the country code where the product is manufactured. Customs Declared Value: Allows you to give custom product price for Customs purpose. Instead of the product price, this value will be sent in the API request. For example, if the product price is $10, and you define the customs value in this setting as $15, the customs value, $15, will be sent in the request. Delivery Confirmation: The US Postal Service can tell you the date, time and zip code where your item was delivered, giving you peace of mind. If the postal carrier tries to attempt delivery, you’ll get the date and time of that attempt, too. This service is now called USPS Tracking. Signature Required: In this service, the item can be delivered only after obtaining a signature. Signature Confirmation: In this service, a signature is required from the recipients of their packages. Although USPS Tracking proves that a package was delivered to a particular address, Signature Confirmation proves that it was actually received by the intended recipient or his agent. Adult Signature Required: This service requires the signature of someone who is 21 years of age or older at the recipient’s address. Adult Signature Restricted Delivery: This service requires the signature of a specific addressee (or authorized agent), who must be 21 years of age or older. None: To completely disable delivery signature option. Let’s now see how these settings are applied. Once all the plugin settings are configured and saved, you can move to the front-end of your WooCommerce store to see the affected changes. A screenshot of the sample cart page is shown below. Open an order to view order details. The Generate Packages button for the order is displayed as shown in the screenshot below. Once you click on Generate Packages button, selected shipping service, package type, and the package details are shown. The available services with their respective costs are listed as well. If you want to add additional packages, then click on the Add Package button and enter weight and dimensions of the package. Click on Create Shipment to proceed with label printing, as shown in the below screenshot. The shipment is finally created, and a shipment tracking ID is generated, as shown in the screenshot below. The shipment label is now ready to be printed. To do so, click Print Label. A screenshot of sample Stamps.com shipment label is shown below. 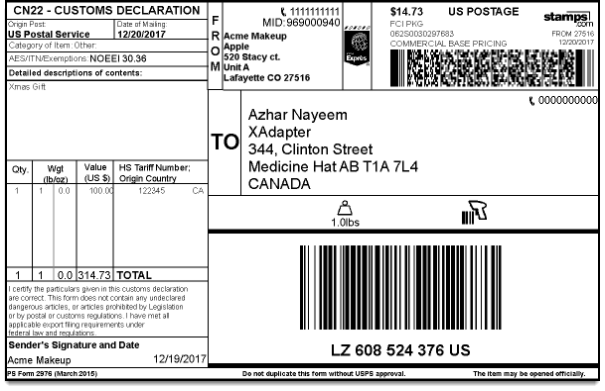 With our WooCommerce Stamps.com-USPS plugin, you can print labels for international shipping with Customs Declaration Forms as well. A sample international label is shown in the below screenshot. How to download WooCommerce Stamps.com shipment labels? Not only can you print shipment labels, but you can also download respective PDFs too. This option is available in WooCommerce Orders page. To do this, go to Dashboard > WooCommerce > Orders. A sample screenshot is shown below. Click on Stamps.com icon in the Actions column, to download the shipment label. You can generate shipment labels in bulk on the WooCommerce Orders page. Select the desired orders to print the labels, and select Create Stamps USPS Shipment option from the Action list, and click on Apply button. 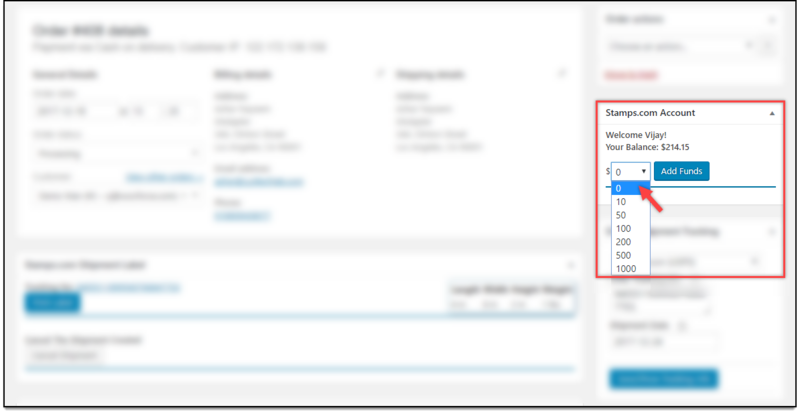 Once the shipment tracking ID is generated, you can enter desired shipment date and click on Save/Show Tracking info button, as shown in the below screenshot. Once the shipment tracking information, you will receive a confirmation message, as shown in the screenshot below. If you have enabled Stamps.com Account Manager in the plugin settings, you can see a Stamp.com Account meta box on WooCommerce edit order page. Here, you can add funds to our Stamps.com account for postage. The setting is as shown in the below screenshot. To generate shipping labels in bulk, you would need our ELEX WooCommerce Stamps.com USPS Bulk Label Printing Add-On. Once you have purchased this add-on, you can read how to bulk print Stamps.com USPS shipping labels to set up the add-on. To generate automatically generate and also email Stamps.com USPS shipping labels, you would need our ELEX Stamps.com USPS Auto-Generate & Email Labels Add-On. Once you have purchased this add-on, you can read how to auto-generate and email Stamp.com USPS shipping labels to set up the add-on. To know more about the product, check out Stamps.com Shipping Plugin with USPS Postage for WooCommerce.